My goodness was it was a hot and sunny day today. I just had to get that out of the way immediately. At the risk of sounding ungrateful that we had a sunny day in Paris, I just want to remind y'all we are from Seattle. The only weather Chris wished we would not get was hot weather. Yesterday, it rained with a high of 84f. It was humid, sticky and hot. Today, we had sun and a high of 84f, and not even a light breeze to be felt. In the city, this feels a lot hotter than 84. Climbing the steps all the way up inside l'Arc de Triomphe it feels much hotter than 84. On a heavy 3 speed bike, riding up a hill through traffic mid afternoon after a couple of glasses of white wine, it feels really much hotter than 84. Are you forming a good picture in your mind? It was hot and we were suffering a little. Where was my car service and ice cold towel at each stop? Oh, that was in my dreams. All right, now that I got that off my chest, on with the fun day. 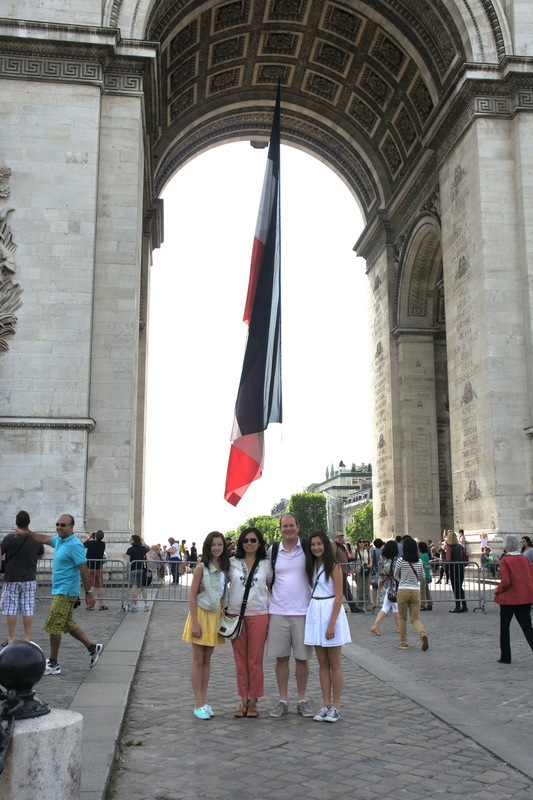 We skipped breakfast this morning and headed straight off to L'Arc de Triomphe, just a short walk from our apartment. We wondered how we were going to get across that huge round about. It is a multi lane / no lane circle and certainly no crosswalk to be found. How did everyone get in the center? There must be an underground passage as we did not see any pedestrians darting across... until the four of us. Surprisingly, the cars did not seem too put off by our obviously stupid tourist, Frogger like, skip to the center. But we made it. We bought a four day museum pass at the airport. This was mainly in an effort to save time and avoid the initial queue of buying a ticket for each place and go straight to the ticket holder line. The man who sold us our passes said the girls admissions to all the museums would be free as they are under 18, so we should not buy them passes. What he did not tell us was that we would still have to go to the ticket counter to get them a ticket even though we don't have to pay for it. Not happy. Thankfully, there was no line yet since we had gotten there early. I hope we will not have to do this at each museum, but I fear it may be the case. After the the Arc, we jumped into the Metro to go to Notre Dame. Upon arriving, we decided to have lunch first and slid into Bistrot Marguerite. It was there and we were hungry. As it turned out, it was quite delicious and the gentlemen who was our server was very nice. It was a very lovely lunch spot. Goat cheese and walnut crêpe. 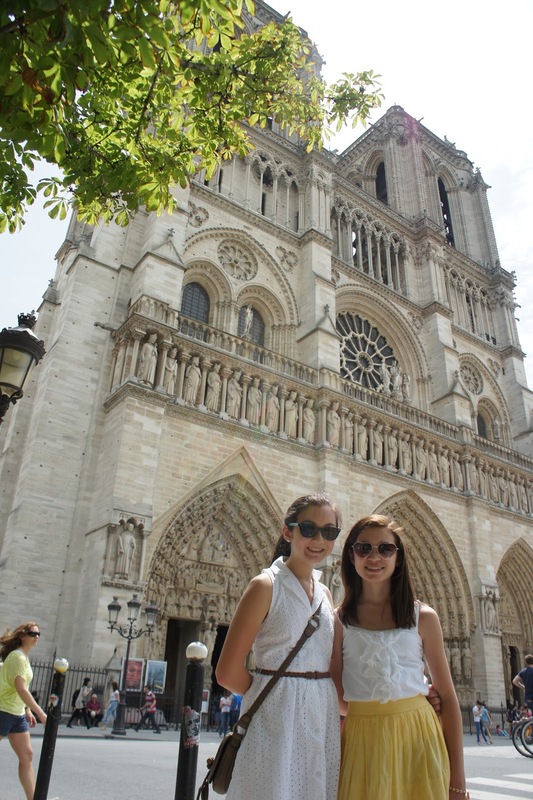 After lunch we walked to the Cathédrale Notre Dame. It is breathtaking. We walked and enjoyed the awe inspiring interior of the cathedral and sat as we gave thanks for the cool respite it gave us from the heat. After Notre Dame, we picked up four Velib bicycles and made our way to Jardin du Luxembourg. I don't know if it had to be uphill, but somehow that was the route we took. Did I mention it was hot? Might I add at this point, that a thick head of coarse black hair is like wearing a solar panel wool hat on your head? After a quick walk through the Jardin, and discovering the only toilette we found was closed on Tuesdays, we came upon a Starbucks where passion ice teas were had all around, as well as a toilet break. After Starbucks, we headed down into the Metro and made our way back to the apartment for showers and rest before dinner. On our way back to the apartment, I stopped in at the Boulangerie to see if I might find a Canelé which Desiree had asked me to investigate. Indeed they had them there. I picked one up and had my first bite. It was not what I expected. They look so beautiful and I imagined them to be moist, light on the outside and custard filled on the inside. Instead, it had a gummy texture to it and really did not have much flavor. Perhaps it was not a good one as the descriptions I've found on the internet did not match what I ate. More canelés will be needed to decide. 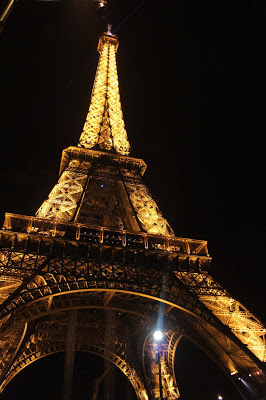 After we recuperated in the apartment for a bit we were off to dinner and then a night visit to La Tour Eiffel. We wanted something different tonight, so we headed to Del Papa for some pasta and pizza. We did miss our pasta but we have been satiated. After dinner we taxied down to La Tour Eiffel. I think it was the general feeling that when in Paris, one must go up the Eiffel Tower. I suppose it's much like going up the Empire State Building or the Space Needle. Now, if you are heavily into this type of thing, then I encourage you to do it. Stella was the most enthusiastic and I, wanting to be a good parent, and not have any regrets after the girls' first trip to Paris, emphatically said, yes, we must do it. We arrived at approximately 10:00pm and got into what did not seem like a horrible line. We were deceived. Winding, winding, winding, surrounded by people and it was still 80 degrees out, no breeze. After one hour and forty minutes, two separate elevator rides, one final small stair climb, we finally arrived at the top. Admittedly, it was a beautiful view of Paris, from what we could see, sandwiched in with the crowd at the top. After 5 minutes, we were finished. Back in line to make the trip downward. Once street side, we breathed a sigh of relief and waited a few minutes for midnight when once again, the Tower would be lit with sparkly lights. We decided the view of the Tower from the street was far better than the view from the Tower, and far less effort. After arriving back at the apartment at 1:00am, dissension was in the ranks. Perhaps it was the long day of touring and that last line put us all over the edge. Or perhaps it was the heat and our brains had become irrational. Come to think of it, dissension is not accurate. Once one of us spoke out, we all chimed in agreement. Tomorrow, we shall view the Louvre from the outside, rather than from within. Weather forecast for Wednesday, high of 86, scattered thunder storms, 85% humidity. Yes, I'm still a little surprised after having the second one. Both were exactly the same. They are beautiful and I would have thought would taste much different they they actually did. Canelé are amazing but most often, sadly, in Paris they are far from amazing. Our friend in Paris is from Bordeaux (the birthplace of the delights) and he makes fabulous canelé from scratch. Made correctly they are really really fabulous - likely as you have read. If you are ever in Bordeaux you must try them as they are delish from most makers in that town. Samedi, a Trip to Bayeux.